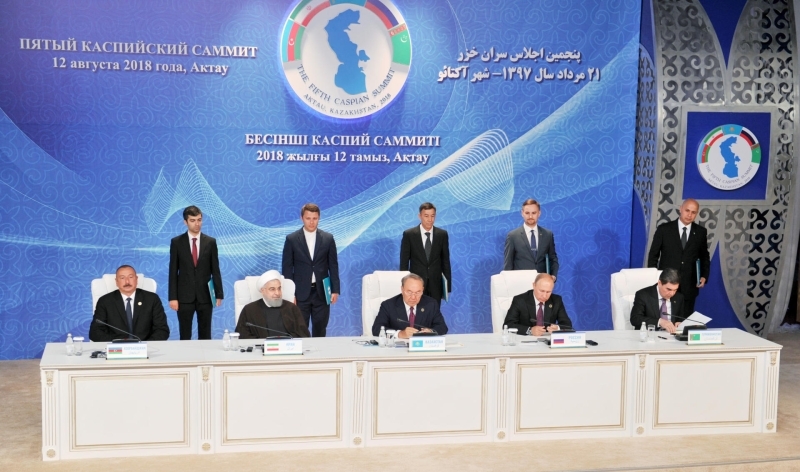 The presidents of the five Caspian Sea littoral states – Azerbaijan, Iran, Russia, Kazakhstan and Turkmenistan – have signed a historic convention on the sea's legal status after more than two decades of discussions at the V Summit in Aktau, Kazakhstan. The Caspian Sea convention has been drawn up in 24 articles with the most important highlights being a ban on military presence of all foreign countries in the sea and transit of military consignments belonging to foreign countries. The convention emphasizes that the Caspian Sea belongs to all littoral states, prohibiting establishment and handing over of any kind of military bases to foreign countries. The Caspian Sea Legal Regime Convention also puts emphasis on sovereignty and sovereign rights of littoral states while recognizing their right to decide on the sea. Caspian states sign six documents for strategic, economic cooperation. In a related development also on Sunday, high-ranking officials of the five Caspian Sea littoral states signed six documents for strategic and economic cooperation in the presence of their respective countries' presidents. The sides agreed to cooperate in transportation, trade and economy, the fight against terrorism, and the battle against organized crime as well as border security. Addressing the summit, Azerbaijani President Ilham Aliyev characterized the signing of the convention as a historic document. “The signing of the convention on the legal status of the Caspian Sea is a historic document. At all stages of the preparations for this document, Azerbaijan has worked constructively and made its contribution alongside other Caspian littoral countries to make it ready for signing. I would like to express my gratitude to colleagues for their hard work, so that we can sign this important document defining the general legal regime of the Caspian Sea,” Azerbaijani President Ilham Aliyev said. Even before the signing of the Convention, the Caspian Sea was a sea of security, a sea of stability, and our relations, both bilateral and multilateral, were the guarantor of stability and security in the Caspian. There is a high level of cooperation, trust and interaction among Caspian littoral countries, and this is the main guarantor of security and stability, the president said. Today, security and stability in the Caspian Sea are determined by the convention we have just signed. Of course, this opens up broad prospects for close cooperation among Caspian littoral countries, solution of issues of economic and transport nature, issues that will contribute to improving the living standards of our peoples. Azerbaijan is making an active and great contribution to improving the environmental situation in the Caspian. The measures our government is taking are aimed at preventing pollution of the Caspian Sea, especially when carrying out oil and gas operations. During the Summit, I already spoke about this and I want to say again that all the oil and gas operations Azerbaijan has carried out in the period of independence comply with ISO international standards, the president added. Next year, we will celebrate the 70th anniversary of oil production in the Caspian Sea, which represents first offshore oil production. Of course, over the years of exploitation of the Caspian's oil and gas resources, the Caspian ecology has been affected to a certain extent. But our country is doing its best today to make the Caspian a zone of environmental development and stability. Azerbaijan invests heavily in the transport infrastructure, and the projects we have implemented allow us the opportunity today to view the Caspian as an important transport artery. The East-West corridor within which Azerbaijan provides transit services to Kazakhstan and Turkmenistan and the North-South corridor through which Azerbaijan transits cargoes between Iran and Russia are projects that strengthen economic cooperation, create new jobs, bring our countries even closer together and contribute to the strengthening of stability and security. As part of the meeting today, I noted that cargo traffic between Iran and Russia along the North-South corridor has grown more than 100 times this year. All work in this direction on the territory of Azerbaijan has been completed, and we expect an increase in freight traffic. Azerbaijan has also carried out a project linking the railways of Europe and Asia, and we expect a huge increase in freight traffic along this corridor as well. All these are additional opportunities for our countries. This means economic prosperity and the transformation of our countries into an important transit junction of a global scale, Aliyev said. Of course, today's signing ceremony opens up new prospects for us. We aim to continue cooperation. Azerbaijan has very close and trusting relations with all Caspian littoral countries, and these relations are based on respect for mutual interests, equality, respect for the territorial integrity and sovereignty of all countries. I would like to express my great satisfaction on behalf of all Azerbaijani people with the fact that we have finally signed this important document, which will play a huge role in the successful development of all our countries in the future. Russian President Vladimir Putin has highly assessed the outcome of the V Caspian summit that ended with the signing of the convention on the legal status of the Caspian Sea. "Naturally, this event will go down in history as the one that took place in Kazakhstan. It is a great event we have been heading to for two decades, have been trying to find a solution. And now it is found. Naturally, it will encourage closer cooperation in the Caspian region," Putin said at a meeting with Kazakh President Nursultan Nazarbayev on Sunday. "As for bilateral relations, our trade is growing, projects we discuss and support is developing. They are Baiterek, energy, transport cooperation, other programs. There are very many interesting plans. I am sure all of them will be successfully implemented," he stressed. Nazarbayev thanked the Russian leader for his active participation in preparations for today’s summit and in the work on the convention. "Today, we reached a historic solution for cooperation between the Caspian littoral nations," he said. Russian President Vladimir Putin has called on his counterparts from other Caspian littoral nations, namely Kazakhstan, Azerbaijan, Iran, and Turkmenistan, to focus on the development of digital economy. "Russia calls on the Caspian littoral states to focus on cooperation in the sphere of digital economy, to introduce information and communications technologies and electronic commerce, to digitalize foreign trade operations, the shipments and logistics sectors," Putin said at the Caspian summit. He said he hopes an intergovernmental agreement on cooperation in the sphere of transport on the Caspian Sea will help develop a common integrated infrastructure. "Transport links is a key factor for sustainable growth and close cooperation between our states," he stressed, adding that Russia is implementing a strategy for the development of sea ports in the Caspian basin till 2030. Thus, it is planned to build a deep-water port near Kaspiysk by 2025. The port will be capable of handling heavy-duty vessels with a payload of 15,000-25,000 tons. On the fringes of the summit, the Iran president discussed bilateral ties with Russian, Kazakh counterparts. "Bilateral and multilateral cooperation of Iran and Russia in different regional and international matters, including regional security and fighting terrorism and Daesh [Islamic State group] in Syria have had positive regional effects and this cooperation should continue until the full eradication of terrorism,” Rouhani said at the meeting with Russia’s Putin. For his part, the Russian president referred to the developing relations between the two countries and said that "Moscow is ready to further develop relations and cooperation with Tehran in areas of interest to both sides". He also described the Joint Comprehensive Plan of Action (JCPOA) - the 2015 Iran nuclear deal - as an important international agreement and emphasized the importance of all parties’ efforts to keep the deal after the U.S. government's unilateral withdrawal from it. At his meeting with Kazakhstan President Nursultan Nazarbayev, Rouhani described Tehran-Astana relations as strategic, close and developing. "The ample potentials of the two countries in different fields can complement each other and we should take more advantage of them to serve the interests of the two nations and the peoples of the region," he said. He added that "Kazakhstan has always been alongside the Iranian nation in international issues, including the JCPOA and we are determined to further deepen these ties." For his turn, Nazarbayev said that "Kazakhstan always seeks ways to develop our relations with Tehran". Referring to the JCPOA, he also voiced Kazakhstan's support for the continuation of the JCPOA and its full implementation. All the Caspian Sea littoral states have been set to disallow the presence of foreign military forces in the Caspian Sea, Iranian Foreign Minister Mohammad Javad Zarif said. "We are glad that there is unanimity on confining the exclusive right of presence and sailing [in the Caspian Sea] to vessels carrying a flag of one of the littoral states, as well as on prohibiting the presence of foreign forces," Iranian Labor News Agency (ILNA) quoted Zarif as saying on 11 August, at a meeting of the foreign ministers of the five states in Aktau. The new convention will not include the issue of division of the borders of the Caspian Sea and the seabed, as well as the precise wording with geographical coordinates of the boundaries of sectors. "These issues have been postponed to be discussed in separate agreements in the future. We hope that the Caspian Sea littoral states will finalize these matters as well in the near future," Zarif added. The minister said the convention is not considered to be the end of the talks, but rather a turning point and a beginning of negotiations on new essential agreements. Javad Zarif earlier commended the solidarity among the Caspian Sea littoral states, saying that the five countries would further continue cooperation on "unresolved issues." "Day of solidarity of Caspian Littoral States: Codifying cooperation on environment, shipping, fisheries, sustainable development & security w/o foreign military presence," Zarif said in a post on his official Twitter account on Sunday. He added that the five Caspian Sea states agreed to "continue friendly dialog on unresolved issues of delimitation & shares of sea & its resources." Addressing a meeting of the Caspian Sea states' foreign ministers on Saturday night, Zarif said the convention on the sea's legal status would be a very important step, which would put an end to 21 years of negotiations. "The signing of this convention is not an end to all negotiations and measures in the Caspian Sea, but it is in fact a turning and start point to implement the agreements and supervise the implementation as well as open the [future] talks to sign new and necessary agreements," the top Iranian diplomat pointed out. Before heading to Aktau, Iranian President Hassan Rouhani said under the convention, all legal issues of the sea should be implemented through the consensus of the five littoral states, stressing that the agreement did not include dividing the waters. "The convention stipulates that all legal issues of the Caspian Sea are operational and applicable only through the consensus of the five countries, which is very important and fundamental," he said. Speaking to IRIB in an interview on Saturday, Iranian Foreign Ministry Spokesman Bahram Qassemi said, "We have to a large extent made good progress and maybe more than 80 percent of the points demanded by the [littoral] states have been considered and included in this convention." The Caspian Sea is the largest enclosed body of water by area and is variously classified as the world's largest lake or a full-fledged sea. The Caspian Sea littoral states have been discussing a convention on the sea’s legal status for years, which will finally turn out to be a comprehensive document outlining the duties and rights of the five littoral states as well as the framework of cooperation among these countries. Under the new document, the water area of the Caspian Sea will be divided into internal and territorial waters, fishing zones and common water area. Territorial waters are allocated 15 nautical miles per country. The outer boundary of territorial waters will become state. Territorial waters are also adjacent to a fishing zone of ten miles. In their fishing zone, each country has the exclusive right to fish. Countries themselves will determine the allowable catch volume and distribute it to national quotas. A common water area starts behind the fishing zones. There ships will be free to fly under the flags of the Caspian states. The bottom and the bowels of the sea will be divided between countries through the conclusion of bilateral agreements. One of the main provisions of the document RIA Novosti refers to the paragraph on the non-presence in the Caspian of the armed forces of third countries. The Convention also prohibits activities that damage the biological diversity of the sea.